A letter from L. Ron Hubbard told how the technology had reached miracle level: “I can break a really rough case in 20 or 25 hours at the outside—change it utterly—and I can change a chronic somatic in half an hour. I can make kids walk in a few minutes who were crippled.” Mr. Hubbard had not only solved human aberration and psychosomatic illness, he had demonstrated the true nature of every individual as a spiritual being. Having discovered the full potentialities of a being at Operating Thetan in the Philadelphia Doctorate Course, Scientology 8-8008 and The Factors, he now set about to codify auditing techniques, write texts and train auditors. Nearly 400 delegates gathered in Philadelphia, where Mr. Hubbard told them a tool now existed to construct a new civilization. 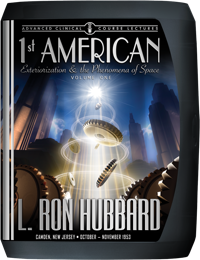 Hence, he emphasized organizational action and cooperation, enumerating functions a Scientologist should advance in society and which—through action—answer the question, “What is a Scientologist?” Here is a Congress that simultaneously spans L. Ron Hubbard research from the exteriorization techniques of SOP 8 and provides a means to bring a humane civilization to Man. So wrote Ron from Seville, Spain, in the summer of 1953. In the three whirlwind years since publication of Dianetics: The Modern Science of Mental Health, the technology had advanced to miracle level. Mr. Hubbard had solved the problem of human aberration and psychosomatic illness. More than that, he had demonstrated for the first time, with certainty, what Man had only speculated on and hoped for: the true nature of every individual as a spiritual being. Having discovered and mapped out the full potentialities of a being at Operating Thetan in the Philadelphia Doctorate Course, Scientology 8-8008 and The Factors, Ron now faced the task of making those potentials a reality. Auditing techniques had to be codified, books had to be written and materials to train auditors required assembly. Thus Ron set to work, in Europe, preparing the needed curriculums and texts. 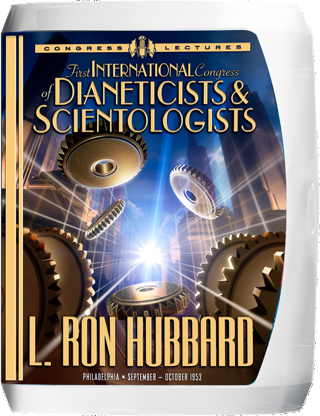 This Congress, then, spans the breadth of Ron’s research from techniques that exteriorize a being as given in Standard Operating Procedure 8 (SOP 8), to the means by which a Scientologist can instill into society the finer qualities of cooperation, love, goodness, mercy and justice.